In order to be able to reduce emissions and mitigate the effects of climate change, renewable energy must be implemented on a broad and profound level. Thankfully there is good news. Major volatility in the global oil and gas markets and uncertainty about long-term supplies have helped propel a boom in innovation and investment in renewable energy. This fast-growing sector is creating millions of jobs and developing an array of opportunities for community-based small businesses. 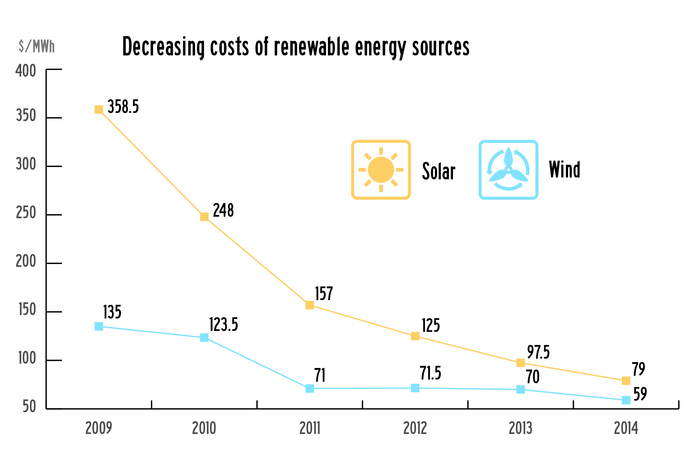 From 2010-2013, global investment in renewable power and fuels surpassed $1 Trillion. Infrastructure development and new technologies are making renewable energy accessible and affordable for utility companies and individual citizens. 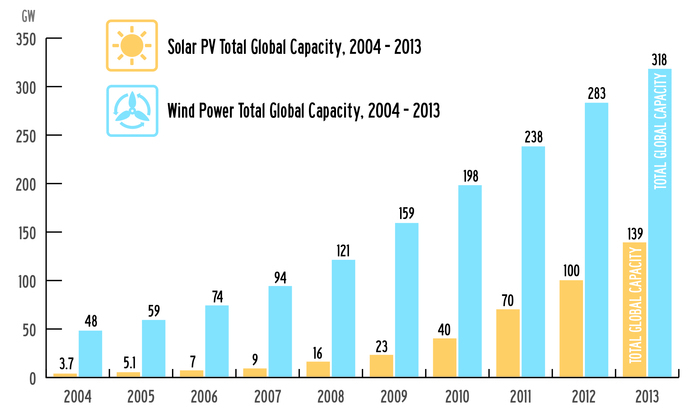 In 2013, renewables accounted for more than 56% of net additions to global power capacity. A great deal of this massive growth has been due the continuous and ongoing reductions in the costs of wind and solar energy. According to Bloomberg solar has reached Grid Parity in 10 states, and is slated to reach Grid Parity in 47 states if existing tax credits are continued. This means that solar provides cheaper energy than the average utility bill, making solar not only the right environmental choice, but the right economic one as well. New renewable energy capacity reduced CO2 emissions by 1.2 billion tons in 2013. In addition to mitigating climate change, reducing C02 emissions is vital to reducing health costs and saving live. Ambient air pollution caused by dependence on fossil fuels is responsible for 3.7 million premature deaths worldwide annually, costing the world’s most advanced economies $3.5 trillion. In the US alone, burning fossil fuels costs over $120 billion in health costs every year.